Is Honey Better Than Sugar? Do Sugars Suppress Immune Response? Is honey better than sugar? – the question many people ponder in the attempts to reduce the amounts of sugar in their diet which has been linked to type 2 diabetes, heart disease, obesity, metabolic syndrome, recurring yeast infections, and other health conditions. This question can be answered with both a “yes” and a “no” depending on what aspect we are looking at: honey as an isolated sweetener or in a bigger picture - as a part of the diet that can impact immune health. IS HONEY BETTER THAN SUGAR AS A SWEETENER? Glucose (also called dextrose) – a key source of energy in our bodies, especially in the brain. Glucose occurs naturally in fruits, vegetables, plant juices, honey, and is a part of more complex carbohydrates which get converted into glucose during digestion to be used as an energy source. This is the form of sugar circulating in our bloodstream, and its high blood levels are an indicator of a prediabetic or diabetic state. Fructose (also called levulose) – naturally occurs in fruits and fruit juices, most root vegetables, honey, tree saps; although in its free state fructose has a very low glycemic index (GI) of 25 compared to 100 for glucose, it has been shown to increase blood glucose as much as glucose itself. High fructose consumption, especially added to most processed foods and OTC medications as high fructose corn syrup (HFCS), has been linked to insulin resistance, obesity, elevated LDL (“bad”) cholesterol and triglycerides, non-alcoholic fatty liver disease, gout, risk of asthma onset in children, and promoting the feeling of hunger leading to overeating. Galactose – doesn’t occur in free form, but as part of compound sugars, most commonly found in dairy, sugar beets, and various plant gums. Sucrose – known as table sugar or simply sugar, consists of 50% glucose and 50% fructose; most commonly produced from sugar canes or sugar beets. Lactose – or milk sugar, consists of joined molecules of galactose and glucose. Maltose – or malt sugar, derived during the process of grain germination; consists of two joined glucose molecules. Disaccharides get digested into their component monosaccharides. There are also more complex, long-chain compound sugars such as polysaccharides and oligosaccharides, and others. This composition tells us that honey is a highly concentrated water solution of approximately 40% fructose and 40% glucose (maltose and sucrose contribute these two simple sugars to the total). Some high density honeys with much lower water content have higher percentages of sugars. Thus, in terms of its simple sugars content honey is almost equivalent to table sugar (sucrose) which is 50/50 glucose/fructose. At the same time, since raw, unfiltered and unheated honey contains enzymes, traces of minerals and B-vitamins, and antibacterial and antioxidant components, it is a better sweetener choice to add to teas, oatmeal, or plain yogurt, for example. Honey’s glycemic index (GI) is 50 compared to 65 of table sugar. It means that honey causes a somewhat slower spike in blood glucose than plain sugar and requires less insulin to be metabolized. In their unprocessed state these alternative sweeteners contain traces of vitamins, minerals and antioxidant compounds, and have lower glycemic indices than refined white sugar (except brown sugar). 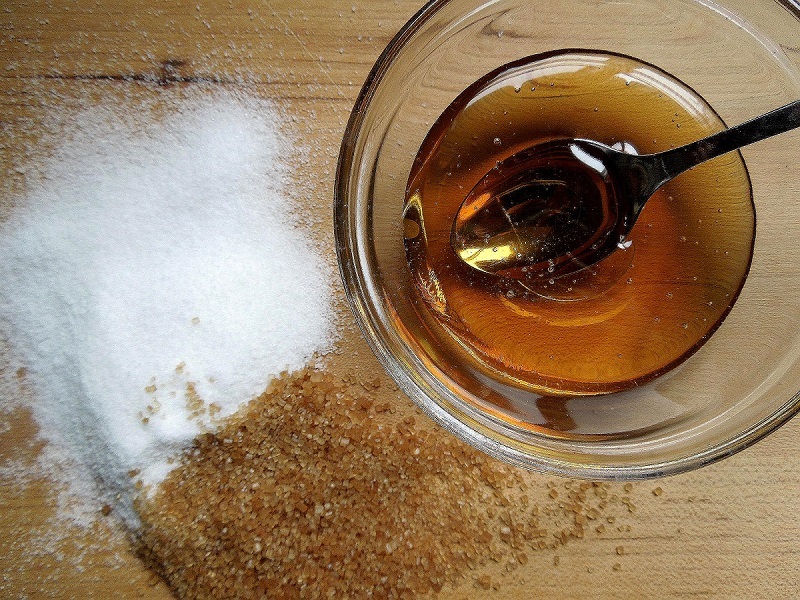 One study looked into the total antioxidant content of various sweeteners and found that refined sugar, corn syrup, and agave nectar contained almost undetectable antioxidant activity; raw cane sugar had a slightly higher rating. 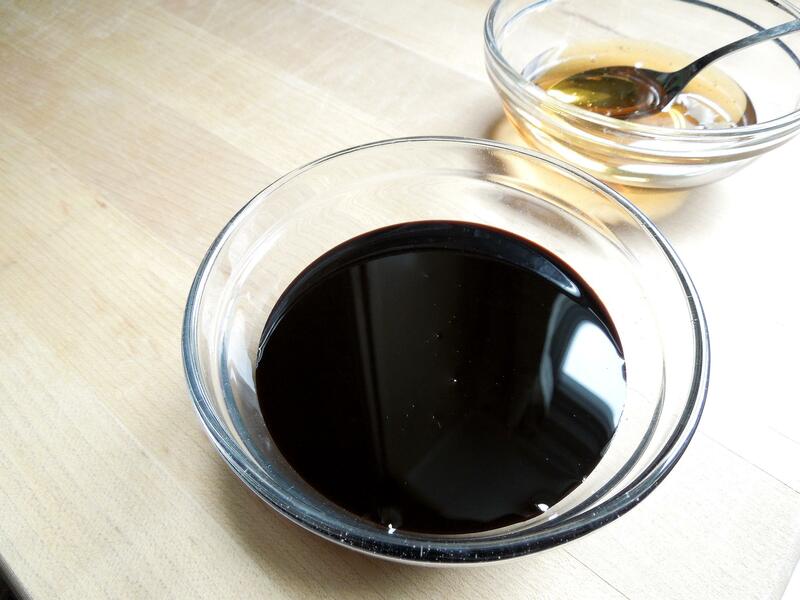 Dark and blackstrap molasses had the highest antioxidant content, while maple syrup, brown sugar, and honey showed intermediate antioxidant capacity. The researchers concluded that based on the average consumption of 130 g of refined sugar a day, substituting alternative sweeteners could increase antioxidant intake similar to the amount found in one serving of berries or nuts. 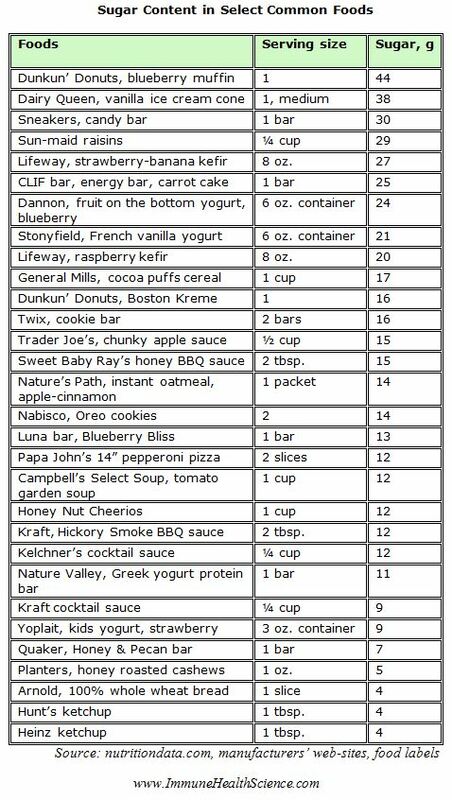 (Total antioxidant content of alternatives to refined sugar. Phillips KM et al. J Am Diet Assoc. 2009 Jan;109(1):64-71). Of course this conclusion does not mean that high sweetener consumption is an ideal source of antioxidants in one’s diet as you will see below. Heating honey for long periods of time as, for example, in baking, reduces honey to being no better than refined table sugar. Honey sold in those cute bear shaped containers should be avoided because it is highly processed and there is no guarantee that it comes from bees that fed on flower nectar and not on sugar water or HFCS. Bottom line: as a sweetener for certain dishes and drinks, honey is better than sugar (sucrose), but only if it is raw, unfiltered and unpasteurized. IS HONEY BETTER THAN SUGAR FOR IMMUNE HEALTH? The harmful effect of sugar on immune health was demonstrated in a study that produced an astounding result - the phagocytic activity of neutrophils (type of white blood cells that engulf and ingest bacteria, fungi and other pathogens; the process itself is called phagocytosis) dropped almost 50% in blood samples from human volunteers after consumption of 100-gram doses of various simple sugars: glucose, fructose, sucrose, honey and orange juice. In this study sugar composition of honey was assessed at: glucose - 44%, fructose - 52% and sucrose - 2%. And sugar composition of orange juice: glucose - 25%, fructose - 25% and sucrose - 48%. The greatest effect of suppressed neutrophil activity occurred between 1 and 2 hours after ingestion and some impact was still evident at 5 hours. Starch (complex carbohydrates) did not have such an effect on neutrophils. These results show that simple carbohydrates impaired the ability of neutrophils to engulf bacteria and thus reduced the body’s resistance to infection. In contrast, fasting for 36-60 hours showed greatly improved phagocytic activity of neutrophils. (Role of sugars in human neutrophilic phagocytosis. Sanchez A, Reeser JL, Lau HS, et al. Am J Clin Nutr. 1973 Nov; 26(11):1180-4). In a more recent review of the literature on the effects of acute hyperglycemia (short-term elevated blood glucose) on the major components of the innate immune system, the research team concluded that “acute, short-term hyperglycemia affects all major components of innate immunity and impairs the ability of the host to combat infection”. (Acute hyperglycemia and the innate immune system: clinical, cellular, and molecular aspects. Turina M, Fry DE et al. Crit Care Med. 2005 Jul;33(7):1624-33). Bottom line: when it comes to our immune health, honey is no better than sugar because it contributes to the total sugar intake and the impairment of immune response to various pathogens. Eat home-cooked meals as much as possible. 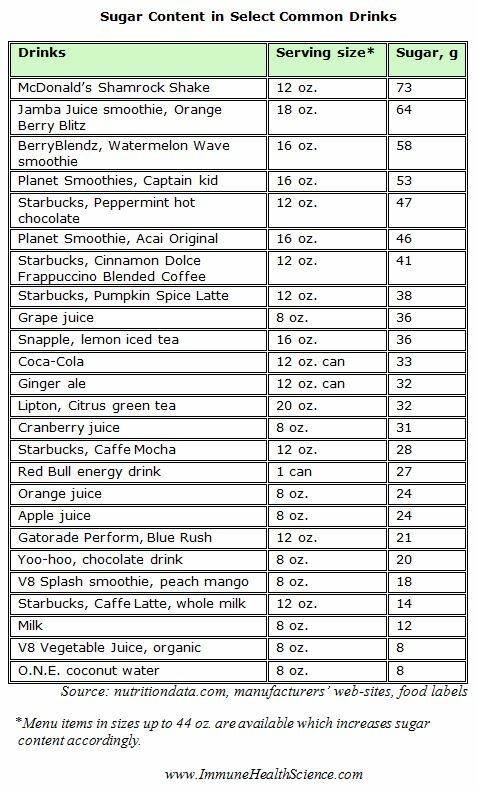 This gives you better control over the sugar content in your food. Read the food labels and do not purchase items where sugar, syrups, dextrose, maltose etc. are listed as the first three ingredients on the list. Reduce or eliminate completely over-processed baked goods such as cakes, pastries, muffins, donuts, cookies, etc. Instead eat antioxidant packed berries for dessert, fresh or frozen depending on the season. When you can’t refuse a slice of the cake at a birthday party not to appear impolite, eat half of it or less, and don’t eat the icing at all which has the most amount of sugar. Eat more vegetables (especially leafy greens) than fruits which tend to be higher in fructose. Drink easy-to-make fruit flavored water or plain water instead of fruit juices, sports drinks, soda and other bottled drinks. Instead of a protein bar, eat a handful of nuts, such as almonds, walnuts or Brazil nuts which contain glutathione cofactor minerals (not honey roasted or chocolate glazed), or try undenatured whey protein which also provides you with the glutathione building bioactive cysteine. If you need to sweeten a homemade smoothie, use a ripe banana, ripe pineapple (a great source of vitamin C, a glutathione cofactor), a couple of dates or raw honey instead of refined sugar or sugar sweetened yogurt. When you are in a coffee shop, opt for regular black coffee, rather than lattes which have up to 10 teaspoons of added sugar while you would use maybe only 2 teaspoons in black coffee. Drizzle a little bit of maple syrup or honey over a bowl of berries instead of whipped cream. Use honey or maple syrup as a pancake syrup instead of commercial syrups which are simply artificially flavored high fructose corn syrups. Or better yet - skip the syrup altogether and top your pancakes with berries. 1. Honey Composition and Properties by J.W. White Jr. and L.W. Doner. 2. Glycemic Index For Sweeteners. 3. Role of sugars in human neutrophilic phagocytosis. Sanchez A, Reeser JL, Lau HS, et al. Am J Clin Nutr. 1973 Nov;26(11):1180-4. 4. Sugar-Sweetened Beverages and Risk of Metabolic Syndrome and Type 2 Diabetes: A meta-analysis. Malik VS, Popkin B M, Bray GA et al. 2010 Diabetes Care 33 (11): 2477–2483. 5. Intakes of apple juice, fruit drinks and soda are associated with prevalent asthma in US children aged 2-9 years. DeChristopher LR, Uribarri J, Tucker KL. Public Health Nutr. 2015 Apr 10:1-8. 6. Dietary fructose reduces circulating insulin and leptin, attenuates postprandial suppression of ghrelin, and increases triglycerides in women. Teff KL, Elliott SS et al. J Clin Endocrinol Metab 2004; 89: 2963–2972. 7. Impaired cellular insulin binding and insulin sensitivity induced by high-fructose feeding in normal subjects. Beck-Nielsen H, Pedersen O, Lindskov HO. Am J Clin Nutr 1980; 33: 273–278. 8. Fructose, but not dextrose, accelerates the progression of chronic kidney disease. Gersch MS, Mu W et al. Am J Physiol Renal Physiol 2007; 293: F1256–F1261. 9. Fructose ingestion acutely elevates blood pressure in healthy young humans. Brown CM, Dulloo AG et al. Am J Physiol Regul Integr Comp Physiol 2008; 294: R730–R737. 10. Effects of high-fructose corn syrup and sucrose consumption on circulating glucose, insulin, leptin, and ghrelin and on appetite in normal-weight women. Melanson KJ, Zukley L et al. Nutrition 2007; 23: 103–112. 11. Fructose consumption as a risk factor for non-alcoholic fatty liver disease. Ouyang X, Cirillo P et al. J Hepatol. 2008 Jun;48(6):993-9. 12. Soft drinks, fructose consumption, and the risk of gout in men: prospective cohort study. Choi HK, Curhan G. BMJ. 2008 Feb 9; 336(7639):309-12. 13. Effects of fructose vs glucose on regional cerebral blood flow in brain regions involved with appetite and reward pathways. Page KA, Chan O, Arora J et al. JAMA. 2013 Jan 2;309(1):63-70. Return to Top of Is Honey Better Than Sugar?